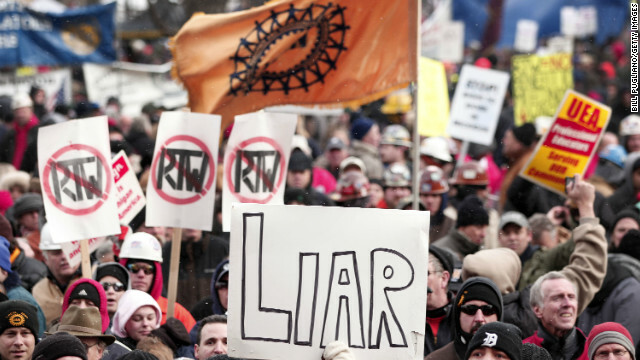 Union members from around the country rally at the Michigan capitol to protest a vote on right-to-work legislation. (CNN) – Michigan is now a right-to-work state, after Governor Rick Snyder signed the controversial measure into law yesterday. The law limits the ability of unions to collect fees from their members. Unions see the law as a direct threat to their ability to raise funds, organize, and have political clout. In response to the bill signing, unions held silent protests in multiple cities throughout Michigan today, continuing what is likely to be a long-term battle. And they unleashed vocal anger on Tuesday in a massive protest at the Michigan State Capitol. [4:41 ] “All that are speaking out here at the capitol, and all over the state… For them this is the beginning of the 2014 election cycle,” said Mark Schauer, a representative with Laborers-Employers Cooperation & Education Trust. The Midwest region has long been a union bastion, but unions are now being challenged. In Wisconsin this past March, a new law ended collective bargaining for most public workers. The right-to-work law in Michigan, similar to the one Indiana enacted in February, is even more sweeping because it applies to both public and private workers. Kenneth Dau-Schmidt, a professor of labor and employment law at Indiana University, said it’s too soon to tell what impact the new laws will have. But he pointed to research that show strong unions can raise wages for all workers. “The explanation for this is that if you’re in a state that has union contracts, other employers, even if they’re not union, have to compete with that and they have to provide better wages and benefits in order to get good workers,” Dau-Schmidt said. Michigan’s unions now face a test of their diminished political muscle, whether they can make lawmakers pay a price for supporting the right-to-work law. This isn't about workers rights. It is about protecting Union Bosses salaries and power. Suckers. Most of you people don't know the first thing about unions, or the misery of working in a low paying, non-union shop! You buy the propaganda of business people who are enriching themselves to the detriment of their workers. You people buy the blather of the right-wing media (FOX), paid for by wealthy corporate owners who could care less if you puke and die. Doling out opinions on issues you know not the first thing about is called – ignorance. Most of this is pathetic jealousy because union workers have the courage to stand together to better their lives. Most of you people have WELCOME printed across your chests. You lack respect even for yourselves. I'd never be like any of you. Thank God I'm not a gutless turd like many of you here. Shouldn't you be on a smoke break? When the employer doesn't 'respect' you or has no reason to, you get 'abused'. Unions force the employer to 'respect' them and I believe in the long run it not only leads to better wages, benefits and working conditions, but a better 'relationship' between workers and employers. No one is forced to join the union in my workplace. In fact, non-members enjoy the same wages and benefits fought and negotiated by union officials without paying dues. Non-members do not negotiate for their own wages and benefits, the union does. Saw Piers Morgan whining about guns tonight. Is he even an American? You know what? I don't give a rip about your yak yak pal! This forum is about union rights! Go to a gun rights forum! 90% of union workers have no college education. That tells you something! I do. And so do a lot of others. You are a corporate lackey! I'll bet you don't. The union brought down Hostess. Remember that! No they didn't. Hostess corporate execs did. You don't even know what you're talking about! No corporation in their right mind would close a company that is profitable. If it is unprofitable and not worth the effort of course you close it. Why else does it exist. To keep people employed? The people that join unions are those that would be unable to get jobs on their own. Mostly the people we dont associate with. They are more highly skilled than anyone you know. Most union workers are lazy. They would be unable to stay employed without the union helping them. Actually much simpler than an investigation of all of the unions is to give people the choice to join or not. If a union serves them they will join if not the won't. This is exactly what the Michigan law provides. Amazing how CNN and other news outlets, hide the violence perpetrated by the union demonstrators. Odd, since the quickly jump if they think a conservative is the least bit violent. Perhaps, a press the self-censors is worse than a press that is censored. Tea Party good – and peaceful and clean and patriotic. Unions bad – violent and hateful and dishonest, like the media. The union goons attack of the Fox News commentator is not reported here or any of the big communist news outfits. Did you not see the video from yesterday where union members purposely collapsed a tent on supporters of the governor. There were women and children and handicapped people in that tent. One union member viciously hit one person in the face for times, and broke his tooth. The were verbally claiming they had guns and would shoot someone. This is the news that the liberal and mainline media would not run. And, thus you are mislead. Also, the signs carried by your union friends were just as vile. You really do need to become more educated on the issues instead of spouting the slogans you hear the press feed you. Sure, strong unions raise wages. They also raise prices, and lower global competitiveness. 3) People see that Union demands and quests for power sometimes hurt those paying for their "leadership" - if anyone doubts this, think Hostess - 18K jobs lost because a union boss decided his opinion was more powerful than reality. 4) People see that even the "service" unions care FAR more about money and protecting even the worst workers than they do about the service they supposedly provide. Most can now see that teachers' unions care nothing about education and little about kids, because kids don't pay union dues (the latter is derived from a teachers' union quote). Union membership is declining cuz businesses are getting smarter about avoiding union organizing and GOP governments are making them illegal. Michigan has long benefited from the higher wages union workers have brought to he Michigan economy and tax base. Why can't unions be satisfied. Their wages are above most in the nation. They talk of the rich but who is rich? The average American only gets half or less the wages of the Union. Shut up and get in the back seat! Poor GOP lapdogs can't understand math. Wages have been relatively static for the past 2 decades while Wall Street profits have soared thanks to cheap foreign labor. Most union members have no college education. If you get your head out of Pill-popper Rushbo's backside, you won't get so much manure in your ears. Now think carefully about what you said. "Their wages are above most in the nation". Then you go on to say that non-Union workers only make half of what Union workers make. Now would that alone not be a reason to stay unionized? To make a decent wage, to have decent working conditions? Not to mention that Union wages have kept wages up for the rest of workers. Why do you think so much of industry and businesses packed up and came south? Because there are little to no unions, therefore they can work you however and pay you starvation wages. While the upper echelon get wealtheir and weathier. Oh but no one mentions their outrageous salaries and perks. Tere it is! You don't have the guts to stand together and bargain for better wages and conditions – so let's bring union workers down to the level of our miserable pay! Pathetic! LOL – We've been waiting 30 years for Ronald Reagan's infamous "trickle down". The only thing the 1% tinkled down on us wasn't money or jobs – but it was warm and yellow. "For the 60 percent of the population in the middle of the income scale (the 21st through 80th percentiles), the growth in average real after-tax household income was just under 40 percent." "For the 20 percent of the population with the lowest income, average real after-tax household income was about 18 percent higher in 2007 than it had been in 1979." It's horrible when those who spout partisan tripe are provided facts. Isn't it? Way to go CNN you didn't really show what really happened in Michigan, the violence against the opposing view, punching people, destroying a man's business and using racist slurs, threatening to kill anyone that disagreed with them, yes that was all Union workers, perhaps you should start actually reporting the news if that had been the Tea Party the media would have been all over it. No wonder no one trust the Media anymore, they only report what they want, because this was union workers causing the damage no one bothered to show it. You'd be sort of upset too if someone was threatening your wages and benefits. The union people weren't threatened. You are a Bolshevik who is making stuff up. It's called self-defense. Cluster FOX has been leading the propaganda war for a return to anti-American royalism. Where was your outrage at TEA idiots bringing guns to rallies, or Oklahoma City. You must be another Koch sucker. They must be lying. Midwestern workers are fleeing to the South, and it is in the South that most new factories are opening. Just look at the new Volkswagen plant in Tennessee or the Boeing widebody airplane factory in South Carolina that either just opened or will be opening soon. This is a terrible law, what am i supposed to do now, actually hold down a job ?? ridiculous. It's a self serving lie. Americans, really know what the situation is now concerning the Rich. They will do and say anything to make you think that Unions are bad, but when you do the research, it's easy to see that American Corporations don't care whether you live or die. All they care about is their bottom line.They make a fortune from your cheap labor , what do workers get back ? nothing. That's how they want to keep it. Don't be stupid. Support your local unions. "The 99% of us who are victims will not sit idly by as 47% of us are labeled as victims." You mean like the bakers that took concessions, to save Hostess. Then the managers came back and wanted more concessions. All they really wanted was to blame the unions and walk off with multimillion dollar payoffs. Tell that to the 9,000 other employees without a job, including the Teamsters who were OK with it. Oh. And also tell that to the bankruptcy judge who approved the deal as well. They shouldn't care whether I live or die, all they should care about is their bottom line. That's how capitalism works. You want your employer to guarantee your safety? Earn it. You want good pay? Earn it. Be valuable enough that they have to offer you safety guarantees, that they have to offer you good pay. If a foreigner can do what you do for 1/3rd the cost, then what you do is really only worth 1/3 of what you're being paid. Is a CEO that cruises around in a Private jet and receives millions in bonuses after the company that they are running performs terribly is worth it? The people spoke in this last Presidential election, and I bet the next one in Michigan, they will shout out even louder. So what is stopping or stopped you from being a CEO and showing people how to do it? I mean it must be easy because you can blame them for success that obviously stopped your success. Jealousy does not become you! What is it to you if someone make more than you. As David said "earn it"
Unions are much like credit cards. Handy to have when YOU want something but costs you more in the long run. As wages go up, two things happen: the cost of the product increases which often forces employers to search for less expensive and alternate ways to manufacture or distribute a product. Ya do you thinkthat worth comes from running the business and reivesting in growth. Then you use yoru assets to leverage additional growth. Yet you seem to think growth comes from hiring people, yet they need buildings, training and who gets sued if an employee injures a customer? Net worth is a piece of paper, yet they took out the bank loans and paid them back so who took the risk? A business can be compared to how you run your house. When you go to the store do you buy the most expensive items or do you pay what you the market is? I mean what job at Walmart can't be replaced by many others? I remember a time when it was called having a trade, now you want to own the job, without taking any risk.